MIG welding is an extremely popular type of welding today. It’s so popular, simple, and effective that many welders first start out their careers using this process. The acronym stands for Metal Inert Gas (MIG), but it can also be referred to as Gas Metal Arc Welding or even Metal Active Gas (MAG) welding. No matter what you call it, the process is the same: an electric arc is created between the metal being welded and a wire electrode. The arc is hot enough to heat the metal and the wire, which causes them to melt and join together, creating the weld. Shielding gas plays an important role in this process by protecting the weld, or shielding it, from contaminants in the atmosphere. This shielding process helps create strong, clean welds quickly on many different kinds of metal. The most commonly used shielding gas for MIG welding is a mixed gas of Argon, CO2 and sometimes Oxygen, but the actual gas used will vary based on the material type and thickness. There are three main types of metal transfer in MIG welding: Short Circuit Transfer, Globular Transfer and Axial Spray Transfer. The type of transfer used also depends on material type and thickness, among other factors. Short Circuit. This mode of transfer sees electrode metal deposited in short electrical bursts or circuits. Short circuit is a low-heat method of transfer that requires use of absolutely the correct shielding gas and wire diameter for best results. Wire diameters of .025 to .045 and shielding gases of 100% CO2, or a mixture of 75-80% Argon and 20-25% CO2 are acceptable. The low heat makes short circuit transfer ideal for sheet metal in thicknesses ranging from .025″ – .20″ material. Globular. Globular metal transfer deposits the wire electrode in a combination of short circuits and gravity-assisted metal drops. The drops are irregularly shaped due to the point at which the short circuit ends and the globular dropping begins. Because of this, globular metal transfer welding is harder to control and creates more spatter than Short Circuit transfers. The advantage of globular transfer is in its use of inexpensive CO2 as shielding gas. Argon and CO2 mixes are also used with this method. Axial Spray. Axial spray transfer relies on continuous use of a wire electrode. The electrode is deposited as a stream of small molten droplets. The process is similar to Globular transfer but instead of being deposited as large drops, the droplets are propelled axially across the arc. Argon-Oxygen or Argon-CO2 gas blends are most often used in this method, which works well with all of the most common metal alloys including aluminum, carbon steel, stainless steel, nickel alloys and copper alloys. There aren’t too many limitations to MIG welding but it isn’t as clean or precise as TIG welding which might be a problem in certain applications. 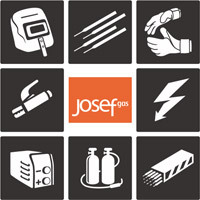 Visit Josef Gas online or in person at 201 Basaltic Road in Concord, Ontario for all of your MIG welding needs. We carry gases, equipment, and wires from all the major brands.